Right Click Enhancer - программа, которая дает Вам возможность настраивать под свои каждодневные нужды функциональность меню, выскакивающего по нажатию правой кнопки мыши. Теперь с помощью этой замечательной утилиты вы можете добавить несколько хороших и полезных опций для вашего контекстного меню правой кнопки. 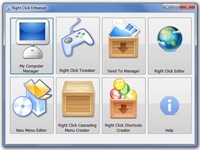 Right Click Enhancer gives you power to control the ultimate right click menu everyone use every day. Right Click Enhancer allows you to edit your right click menu in the way you want. 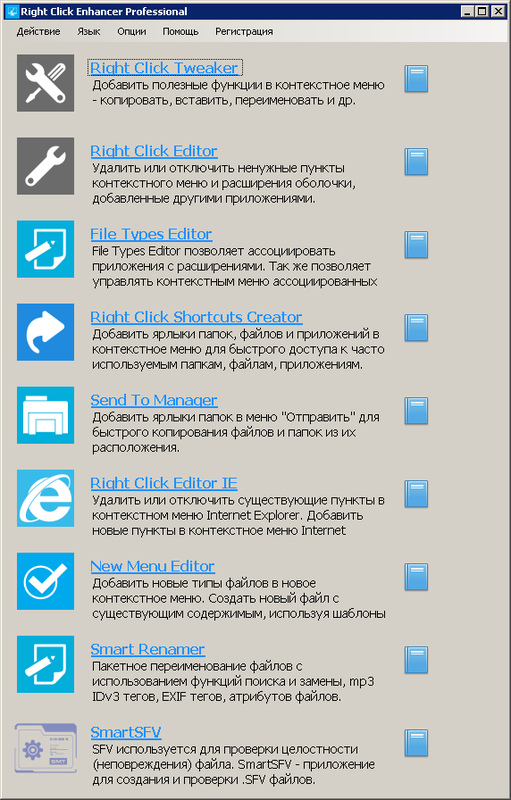 Now with help of this wonderful tool you can add some good features to your right click context menu. Some of the functions it does described below. As name tells this part of a Right Click Enhancer does some tweaks stuff. All of this tweaks are very useful for everyday work. It makes your life easier. All of the tweaks are listed below with there functionality. (1) Copy To Folder & Move To Folder :- When you choose one of the options from the menu, you browse to any place on your hard disk to copy or move the file to that folder. You doesn´t have to navigate to the place where you want to paste your file. (2) Create or Print File List :- Allows you to print or create file list of a folder by right clicking on folder and selecting one of the option. (3) Encrypt & Decrypt :- Allows you to encrypt and decrypt your files and folders. Files encrypted can´t be operable by another user on the PC. (4) Open In Notepad :- Allows user to open any file in notepad by just right clicking it. (5) Open file location :- Allows user to open the file location by right clicking its shortcut. (6) Administrator Command Prompt :- Allows user to open an elevated command prompt with highest privileges from any folder by right clicking it. (7) God Mode & System Configuration Utility (Vista or 7) :- Add the options to open System Configuration Utility(msconfig) and famous god mod from user´s right click menu. (8)Problem Step Recorder (Windows 7) :- Problem Step Recorder is a hidden feature of the Windows 7.This tool bring this to your right click menu. Allows user to add the files or folders to their My Computer,Control Panel or Desktop. User can add folders by directly by right clicking on it by enabling the right click options from My Computer Manager.User can delete those folder directly from My Comuter or Control Panel by right click delete option and then refreshing.Windows XP user can only add the folders and executable files (.exe). Allows user to add folder to their send to menu. So user can copy any files instantly to the selected location. User can remove it from the SendTo Manager.You can add folder shortcut directly by right clicking on it. Allows user to add cascading menus to their right click. When user add a cascading menu Right Click Cascading Menu Shortcuts Creator automatically adds a option to right click menu to add the files and folders to cascading menu by just right clicking any files or folder. User can also add files and folder from within the application by selecting cascading menu and clicking the add buttons. User can remove the cascading menu or files or folder associated with cascading menu. Allows user to add the files or folders to their right click context menu.You can delete files and folders currently in right click menu. - Added new menu named Action in the main menu of all the tools that contains all the actions. - Fixed bug in File Types Editor that crashes application when trying to change the file type of the file extension with no file type associated with it. - Fixed bug in Smart Renamer that crashes application when MP3 file contains invalid header data.